Two years ago, I posted some photos of ants and other insects that had died on the sticky lower portion of thistle flowers. At the time, I speculated about whether or not the sticky bracts below the thistle blossoms were an adaptation to prevent ants from reaching the flowers and “stealing” nectar. 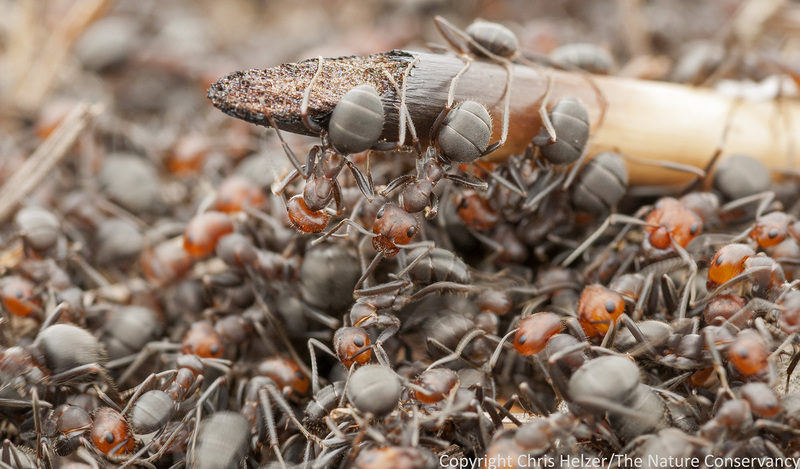 Since ants aren’t fuzzy and don’t dependably go from flower to flower like bees do, they probably don’t provide many (any?) 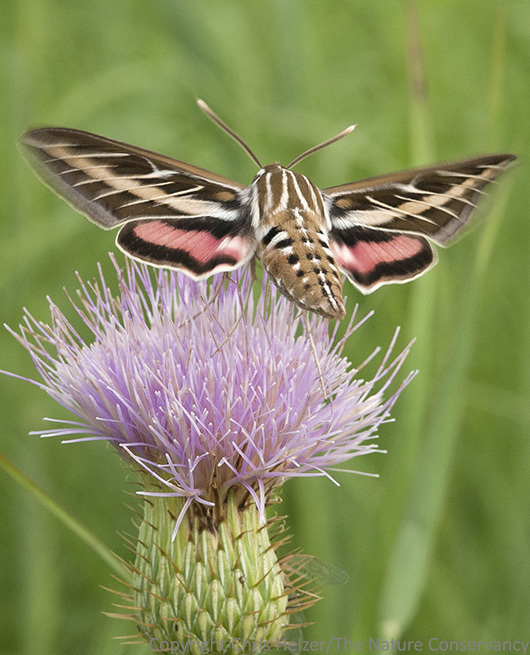 benefits to the flower in return for the nectar they take. Dead ant stuck to bottom of wavy-leaf thistle flower. Helzer family prairie near Stockham, Nebraska. After that post, a friend sent me a journal article detailing a study (see citation below) in the 1980’s that looked at this same phenomenon, trying to figure out what benefit the thistle might get from having sticky bracts. They used Liquid Paper to coat the bracts and make them non-sticky and then measured seed predation between coated and non-coated plants. 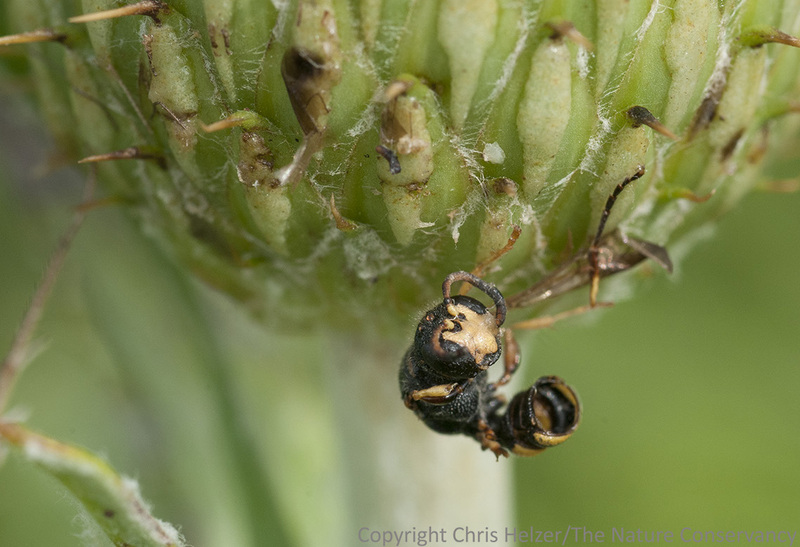 Overall, their results were fairly inconclusive, though they did see higher seed predation by insects on non-coated flowers in one of their sites. The mystery remains! 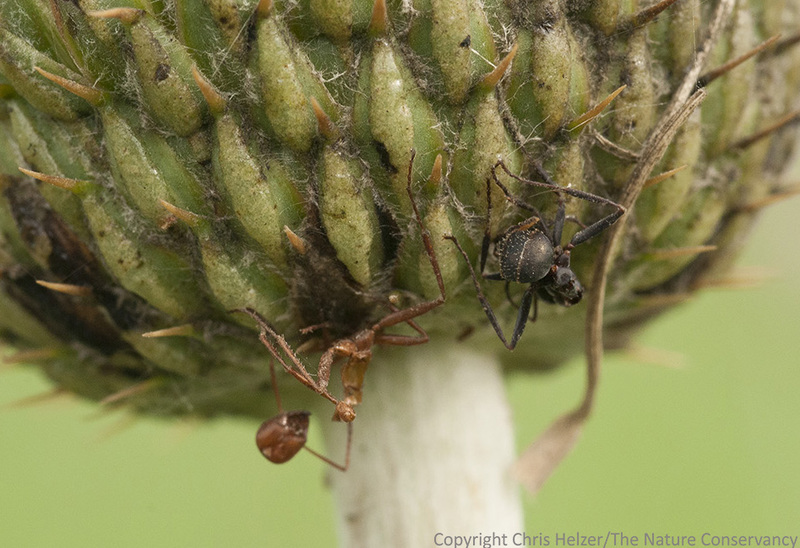 One interesting part of the study was that of the 331 insects they found trapped on the bracts of Flodman’s thistle at Frenchman’s Bluff in Minnesota, 96% were ants. 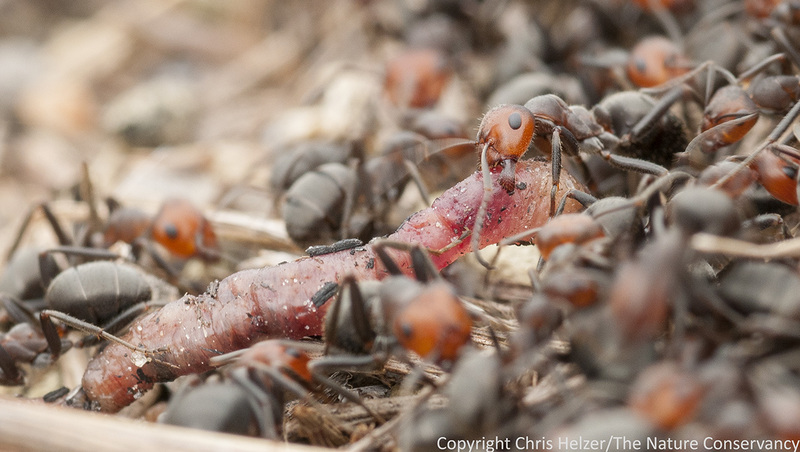 (Given that result, I’m not sure why they focused on seed predation – I don’t think ants feed much on thistle seeds?) 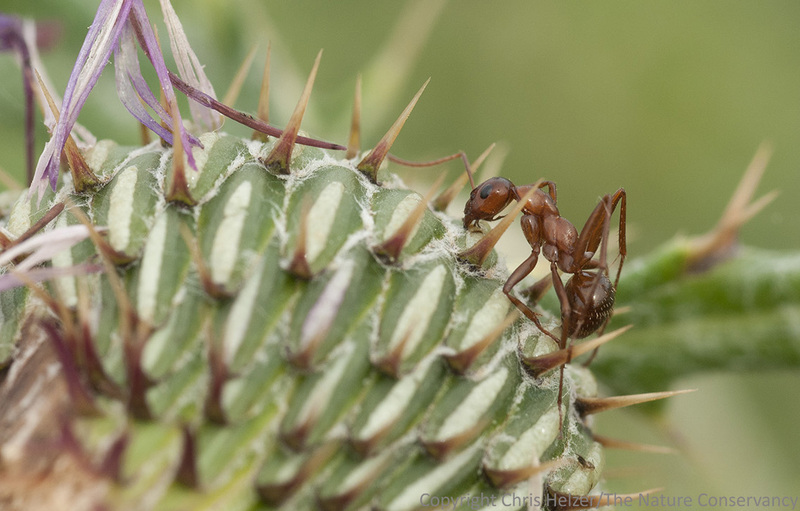 I have been trying to keep track of what insect species I see stuck to thistle bracts during the last few years, and while ants do make up the majority of dead insects found there, a number of other species show up as well. The ant on the left appears to have completely lost his head over sticky thistles. All the photos on this page were taken on the same morning last month. I was walking around our family prairie and looking at the wavy-leaf and Flodman’s thistles (Cirsium undulatum and C. flodmanii) to see what was feeding on them, as well as what insects had become fatally stuck. 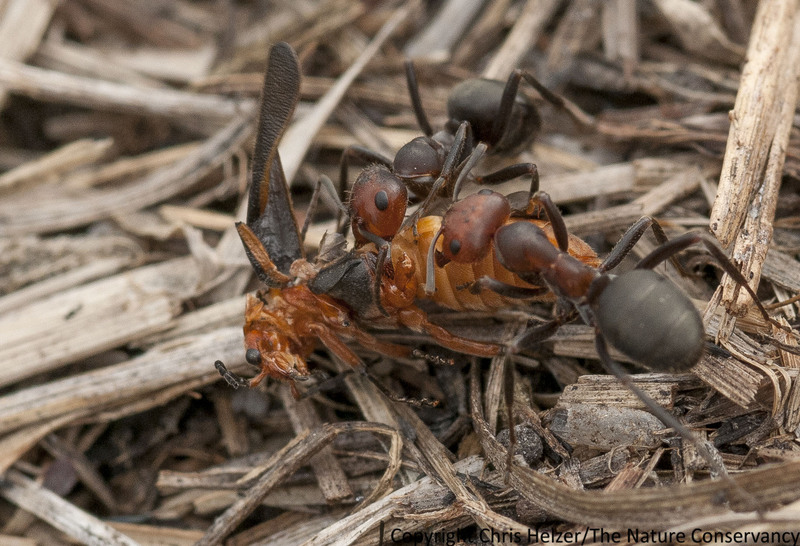 As usual, the majority of dead insects were ants, but there were several bees and even a little cicada as well. More interesting, I also tried to pay attention to insects that seemed to move across the sticky flower bracts without getting stuck. Crab spiders and stink bugs were two that seemed to have no trouble. Spiders, at least some of them, have a special coating on their fuzzy feet that help keep them from sticking to their own webs – does that help them not stick to thistle bracts? Maybe? What about stink bugs? This bee probably chose a nice sheltered place to spend the night without knowing it’d be the last choice it ever made. This bee had been stuck for a while. 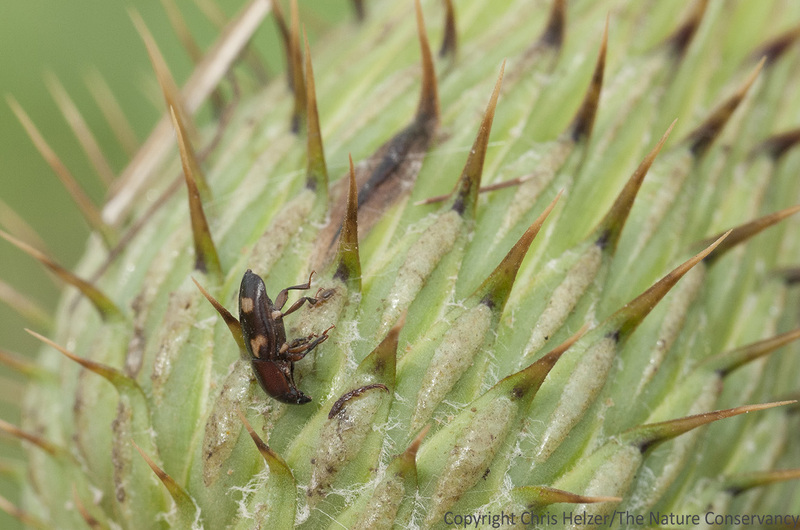 This tiny beetle was another victim of the killer thistles. …and those wings belong to this poor dead cicada. 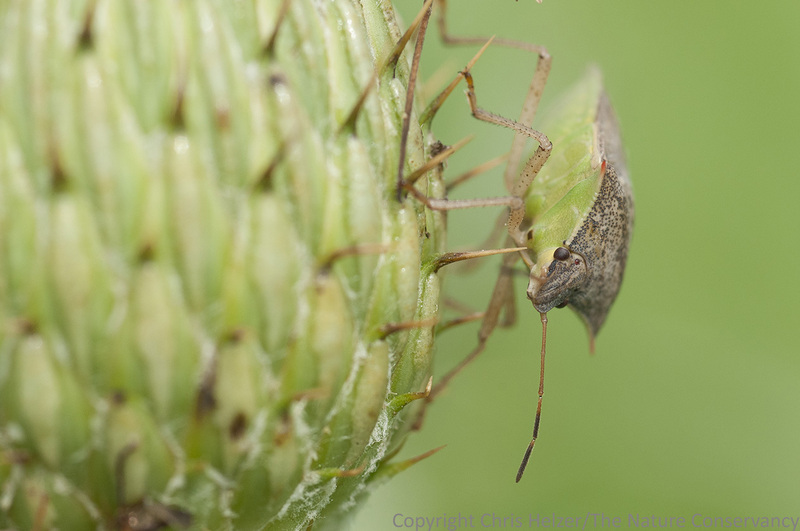 Stink bugs and crab spiders are among the insects that are apparently unaffected by the sticky thistle bracts. This stink bug was moving around the flower with no apparent problems. 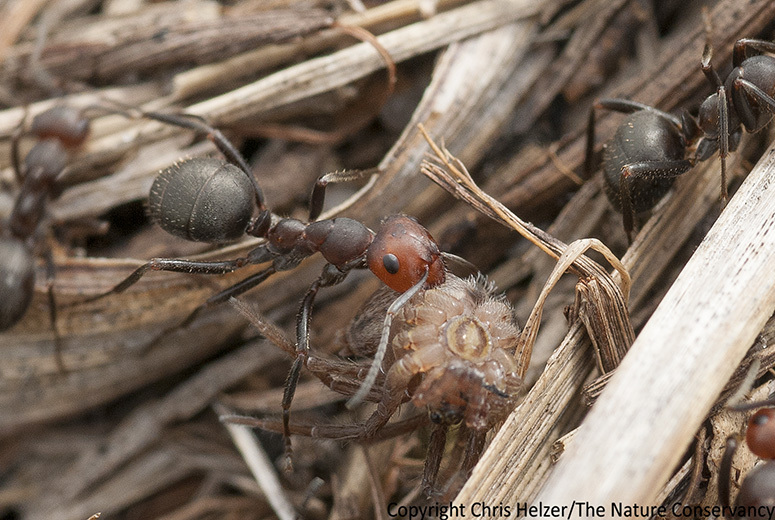 These are the kinds of mysteries that make walking through prairies fun. 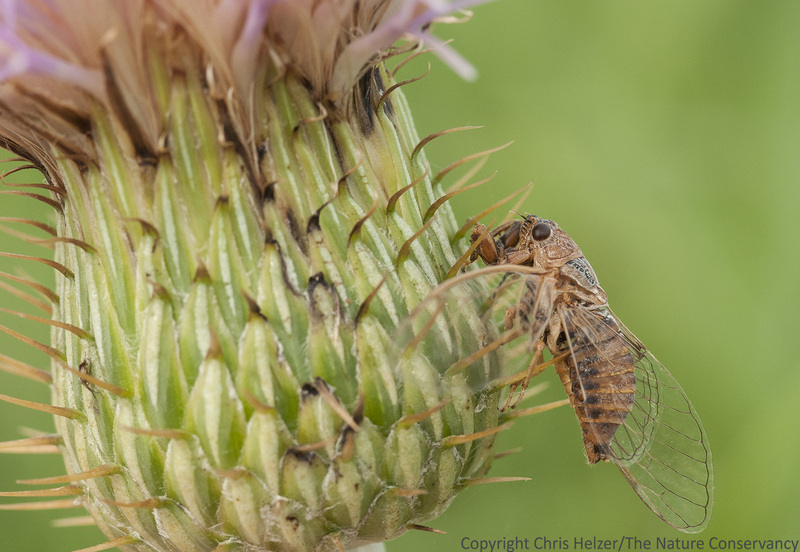 Maybe someday we’ll figure out the secret of thistles’ “bracteal exudate”, but in the meantime, it’s just one of many prairie interactions we can marvel at.